Posted By:Unknown | At:6:24 AM Be the first to comment! A woman who says she witnessed the shooting of unarmed black teenager Michael Brown has released video to CNN that shows Brown lying in the street as officers stand by. 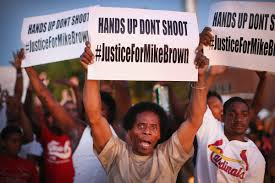 The shooting has spawned a week of protests in which demonstrators have demanded an explanation for Brown's killing. Police in Ferguson, Mo., say officer Darren Wilson opened fire because Brown tried to take his gun during an altercation. Piaget Crenshaw said she has waited until now to release the video because she feared for her safety and was waiting for police to release Wilson's name, which they did Friday. She also said police could have released her video Friday — when they also released surveillance footage that they said showed Brown stealing cigarillos from a convenience store before the shooting. She said police had her video because they confiscated her phone. She shared her video with CNN's “New Day” the morning after police again fired tear has and rubber bullets on demonstrators, as well as children and reporters. The shooting and protests have raised questions about police targeting young black men, the risks of militarizing local police, and freedom of the press. Crenshaw said she witnessed Wilson trying unsuccessfully to force Brown into a car. She said they tussled, and Brown was able to get away because he was “a bigger fella.” Brown's escape “seemed to have upset the officer,” who began chasing Brown, she said. She said she believed Brown was grazed by a shot near his arm, turned, and was then shot multiple times. A private autopsy conducted at the request of Brown's family and released Sunday indicated that he was shot six times, twice in the head. All of the shots were to his front, and one was at the top of his head, suggesting he was leaning forward when it hit. Crenshaw did not indicate that she saw Brown try to take Wilson's gun. Brown's alleged attempt to take the weapon has been the Ferguson police department's main justification for the shooting. Crenshaw said it took her about 30 seconds to run and get her phone, which she used to film Wilson standing over Brown's body. She said she captured footage of Wilson “pacing in disbelief” at what he has done. “It's like he understands that he just shot this boy in the face and that this boy was unarmed,” she said. Though police released the surveillance footage at the same time they released Wilson's name, they later conceded that Wilson was unaware when he stopped Brown that he was a robbery suspect. He and a friend were stopped for walking in the middle of the street, police said.